I had a quick after-class conversation with a student. He pointed me to a song by 21 Savage called “Nothin’ New.” As an English teacher this was a cool moment because here was a student unearthing an allusion in real time (not sure if Kendrick had this in mind, but it’s plausible for sure, after you listen to both songs). 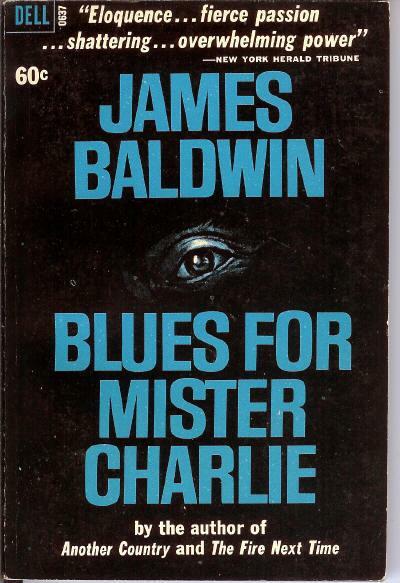 Which brings me to Baldwin and Blues for Mister Charlie. What is eerie and devastatingly effective about this play – a 1964 effort by Baldwin – is the way that it functions almost as a literal script for what goes down in the United States whenever a white person kills a black person. Something distinctive about plays vis-a-vis novels is the way they compress meaning and elevate the universal aspects of the story they tell. Without a narrator, there is rarely “down time” in a play – it’s both more efficient and less “realistic” than the kind of fictional text that can expound at length upon a theme or idea in a narrative voice. In plays need to be performed, so their length will never expand beyond a certain point. Good uses of the genre (at least for me), distill their core ideas into the dialogue of characters in a way other fiction doesn’t, because other fiction doesn’t need to. Baldwin wrote this play as a kind of universalization of the story of the murder of Emmett Till. The play begins in medias res with the words of Lyle, the white murderer, just after he has killed Richard – “and may every n—– like this n—– end like this n—- – face down in the weeds!” then dips backwards to explore both characters’ backstories and communities, and culminates in a courtroom scene and its inevitable verdict of “not guilty.” That inevitability arrives as anti-climax when we reach it – there’s very little suspense – but the steps along the way read, as with so much in Baldwin, as prescient, prophetic even. And so that’s why I started with “Nothin’ New.” For me, as a upper-middle class white person raised in an almost all white suburb, all of this is new. To teenage me, In 1991, the Rodney King beating (and the acquittal of those police officers) was new. My classmates and I argued about it in school like such a thing had never happened before. Trayvon Martin’s murder by a neighborhood vigilante felt new. And yeah, we read To Kill a Mockingbird, but even that, in some sense, was “new” when I read it. New in the sense that it was exceptional, or so we were told, and so we preferred to think. So when I read the pages of Blues for Mister Charlie, I finally started to feel the impact of Kendrick’s words – “ain’t nothin’ new.” I am guessing (though I don’t know) that if I had grown up black, this is a story I would have already known. I think reading this play would be different from that standpoint. So for me, what’s new here is the gradual acceptance – at the level of emotion, not only intellectually (where I’ve accepted it for years)– that this is not new. That this is in the very fibers of this country. And this play helped me feel that. Which I think has to be part of Baldwin’s project. And what’s new is not only the two macro-level steps: (1) dehumanizing violent act against a black victim, (2) the court of public opinion’s re-dehumanization of that same black victim and their family. That’s there in Baldwin, sure. He probably got killed by some other n—– – they do it all the time – but ain’t nobody even thought about arresting one of them. Has n—–‘s suddenly got to be holy in this town? Of course, that’s wrong-headed, but what I now see is that my understanding of this narrative was problematic in a similar way. In my white naivete, I thought that the rhetoric of “black on black crime” was a mid-80’s Reagan-era invention. I did not realize that for at least 60 years (and I’m willing to guess, for the 300 years before that too), white people (fictional or real) have been saying that about black people. Since Baldwin wrote it down with so little explanation or exposition, I can assume that this was already a common talking point, something Baldwin had so grown weary of hearing that it was easy for him to write it into his character’s mouth. Ain’t nothin’ new. Well, yes. From your point of view. But–from another point of view–Lyle hasn’t got anything against colored people… He’s not mean, he’s not cruel. He’s a poor white man. The poor white has been just as victimized in this part of the world as the black have ever been. So sitting here in 2018, I was further hardened against the lazy analysis of the 2016 election that announces that it knows why Trump was elected – “because in this era of multicultural ‘identity politics’ and Hollywood elitism, the poor white people’s voice has gone unheard!” I am guessing that right back to 1776 – heck, back to 1607 – there is a literature pleading that it’s not racism that killed the Native Americans and enslaved the blacks – no – the problem wouldn’t be there if only we had been listening closely enough to poor whites! Ain’t nothin’ new. These are just two particularly resonant moments. There are dozens more: the ideological apparatus, the media talking points – they are all already fully visible in 1964 to James Baldwin. The place in the play we find the most of this is in the surreal courtroom sequence in Act III. It’s a quasi-legal miasma of victim-blaming and narrative indirection. “THE STATE” speaks with a sonority that makes you miss, at least initially, that though this is a murder prosecution, the witnesses being most attacked by it are the victim’s family and friends. There is also a “COUNSEL FOR THE BEREAVED” who, at times, presses an actual prosecutorial case against the murderer (and there is little doubt in anyone’s mind that Lyle is guilty). But it’s a show trial whose unjust conclusion is known to all from the outset. The process of posthumous character assassination of the victim should be sufficiently clear to anyone who followed the Trayvon Martin story (or any of the dozens of other cases which have captured the public’s attention since then). Ain’t nothin’ new. In the documentary 13th, you can see the clips of Emmitt’s Till’s mother Mamie Till Bradley at her son’s funeral. The last time I saw it, that was the most moving moment for me (in a film of pretty powerful moments, let’s be honest). To experience the horror of your child, killed, and to stand up proudly in front of thousands of people – a black student of mine once spoke words to this effect: “don’t get sad about this stuff, stay angry, that’s what you gotta do” – in Mamie Till Bradley’s face, I see something about what he was saying. Stand proud in the face of unutterable loss. But not only did she endure the funeral. She demanded that her son’s body be exposed to the world in an open-casket funeral. After reading Blues for Mister Charlie I see this not only as the act of defiance and confrontation that it was, but also as a mother’s best attempt to stop her son from dying a second death. Those grotesque black and white images of his bloated body starkly contest efforts by the journalistic-historical-industrial complex from rationalizing his murder, from assassinating his character. It was a loving attempt to protect Emmitt Till’s name through the deployment of his hatefully desecrated body. And that feels like something new. But I bet if I read and study more, I will find a whole line of Mamie Till Bradleys, standing in defiance in the face of loss, preserving the dignity of their children through proud confrontational insistence after white people have killed them.